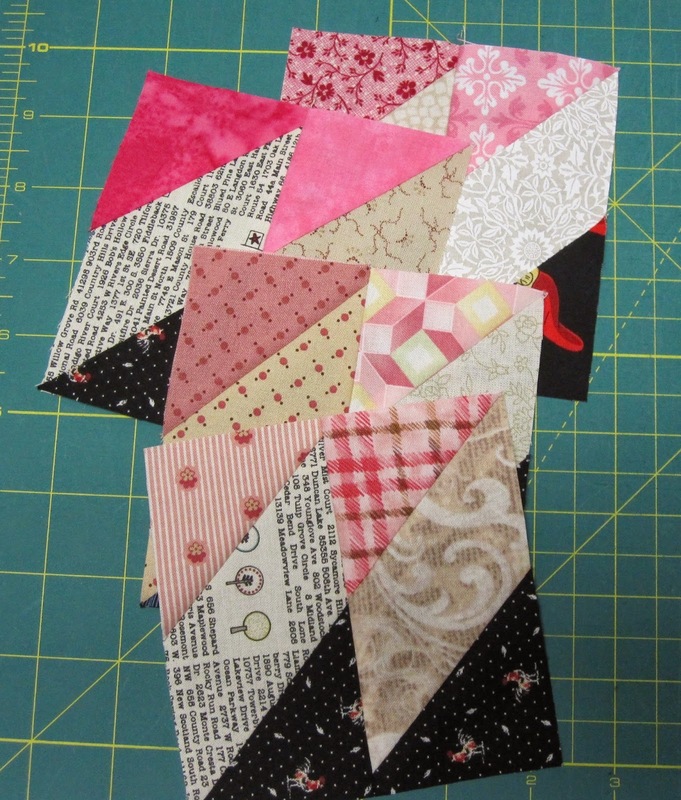 I have a good start on part 2 of the Grand Illusion mystery quilt. I cut all my pieces out first! 200 of each! Yes, my cutting arm was very sore Saturday night when I went to bed. I turned those pieces into Double Diamond Blocks. I had a very hard time at first getting my center points to match but I finally got it good enough. All my single Diamond blocks are done and I have about 20 of the double ones completed. I have the rest of the week to put them together. someone in the comments (don't know who they logged anonymously) asked about how I matched my points so I'm adding some photos to show how I did it. I'm sure there is a better way but this is what I did. ***I do know that I sewed them together wrong but at least you get the idea! I was too busy paying attention to what photos I was taking rather than what direction my colors were going. 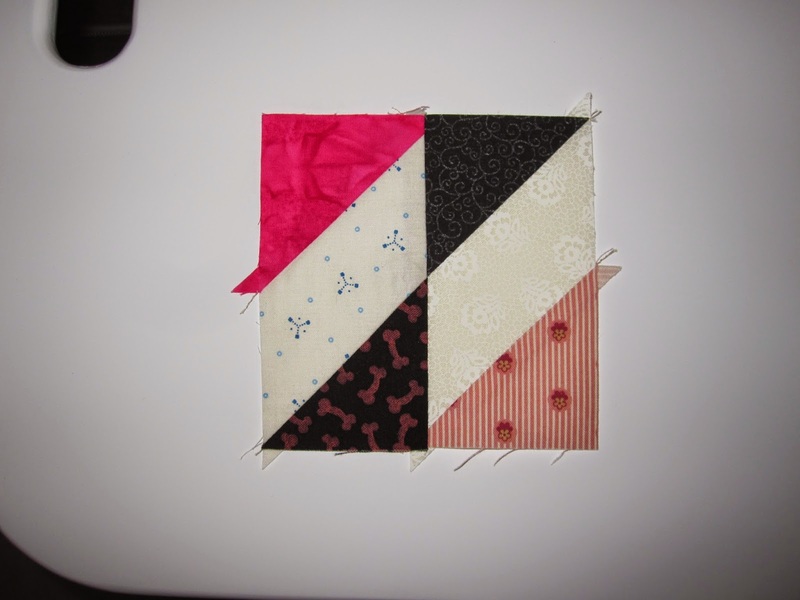 First of all I did not trim my blocks until I had the units sewn together. 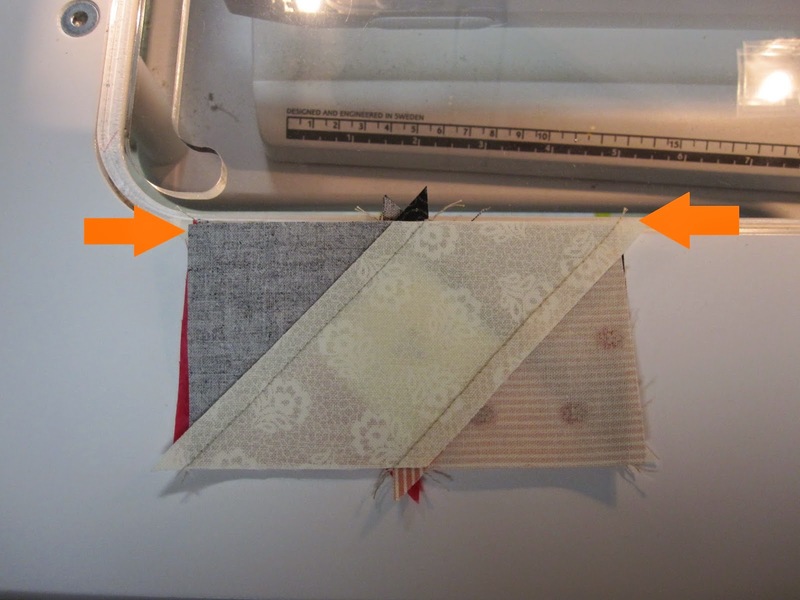 I started by laying the two blocks right sides together and matched the seam along the top and both sides. 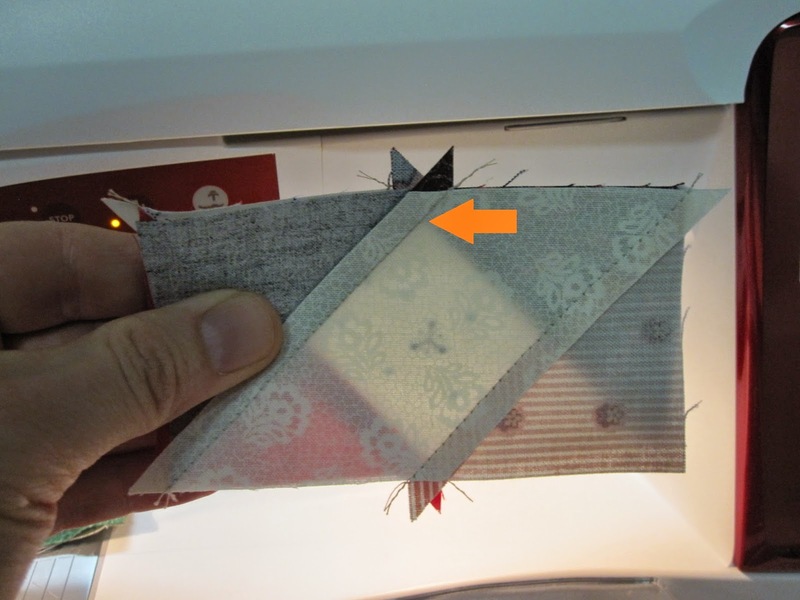 Then I would hold the combined pieces up to the light on my machine and stick a pin in the stitching right where the triangles meet. I would look at the back where my pin was coming out making sure it came out in the stitching on that side. 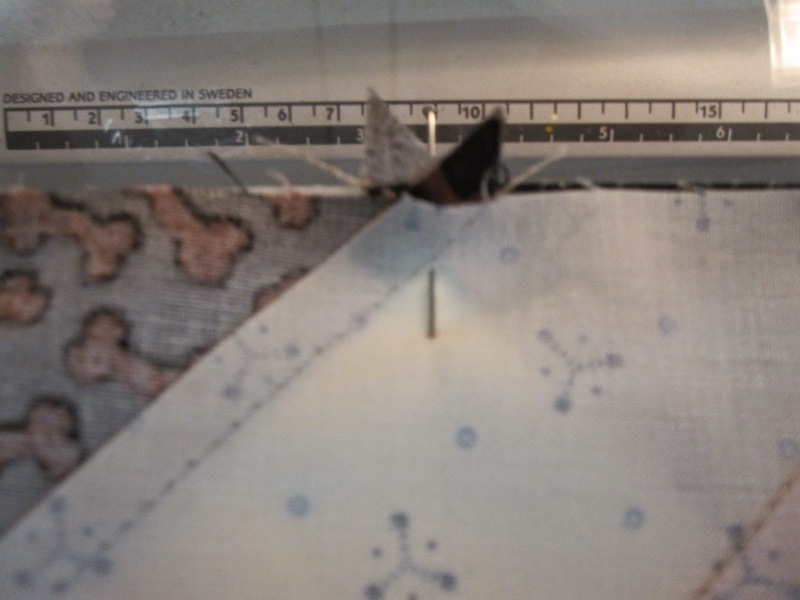 Then I would pin both my ends and sewed them together. I know Bonnie does not pin a lot of her things when she is sewing them. 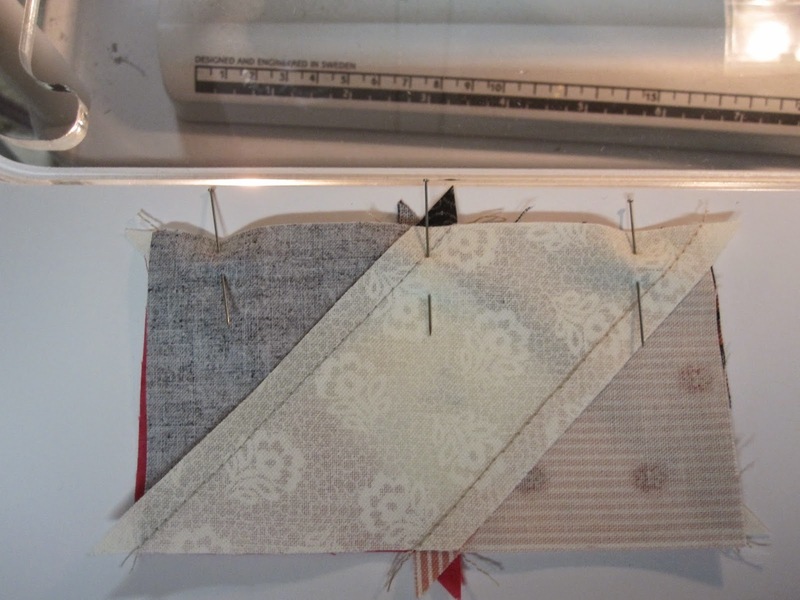 When I was taught to quilt, by my wonderful teacher and friend, Nancy Roelfsema, you use pins to hold things in place. This just helps make sure you will have your points match. Then press...now you can trim! They look wonderful. I am glad to see that you used the #2 method . I am going to try this way and #3 to see which I get the best results from. I love your fabrics, very scrappy and very Bonnie! Thanks for the comment! Yeah method #2 worked well for me. Good luck to you! I'm sure yours will turn out fabulous! I've got my fingers crossed for you!! Thanks for the wonderful comment! 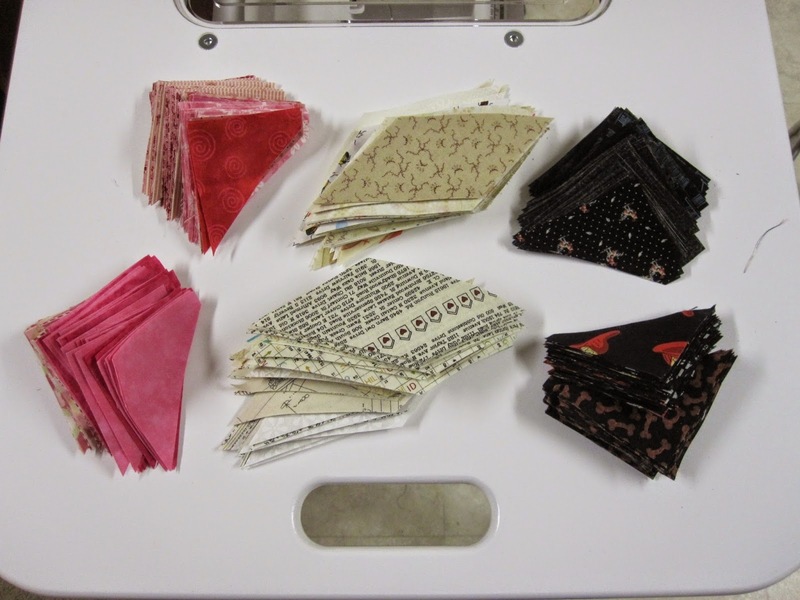 I just went through my stash and picked out the colors needed and then grabbed a couple extra FQ's at the local quilt shop, when I was in. I do enjoy scrappy because I don't try to think about "matching", I just go for the color tone needed. Bonnie makes it very easy, I think! Pretty colours - your blocks look great! Melanie, I'm so glad it was helpful for you. It was fun to add...even though I had to rip it out in the end!! LOL! I'm happy I could help!